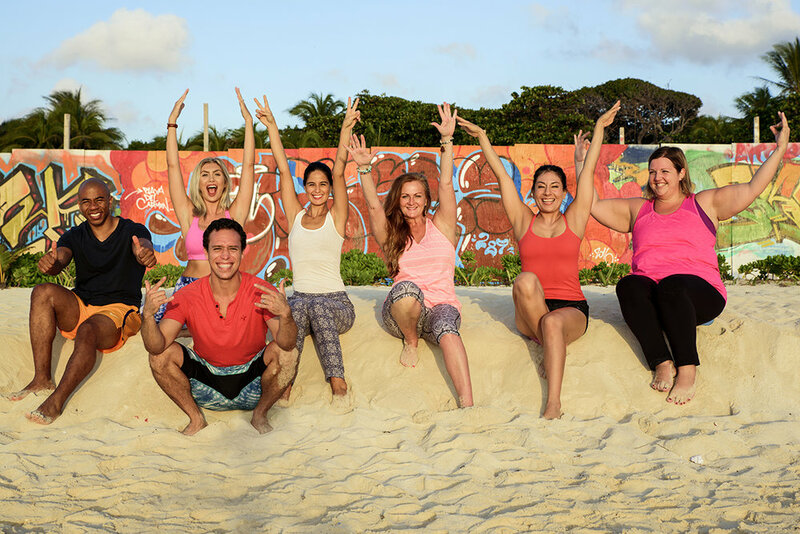 All Yoga By The Sea teachers are Yoga Alliance-certified and are experienced in teaching students of varying ability levels. We believe in non-competitive yoga and support students to approach their practice with loving-kindness while encouraging them to express the architectural foundation of each pose with clarity and strength, based on the trademarked Yoga For EveryBody® system developed by Yoga By The Sea's founder, Arielle Thomas Newman. We draw from the power of this ancient Mayan region for our meditations, which serves as a perfect foundation for connecting with the inner-self. The Yoga By The Sea Teachers Training is comprehensive and in-depth. You will learn to teach both Vinyasa-Flow and Hatha Yoga classes in this course. You can view the content areas that are used for this accredited course by going to www.yogaalliance.org. We cover anatomy, teaching methodology, philosophy, chakras, mudras, pranayama, meditation, diet, nutrition, setting up your business – all the essentials. 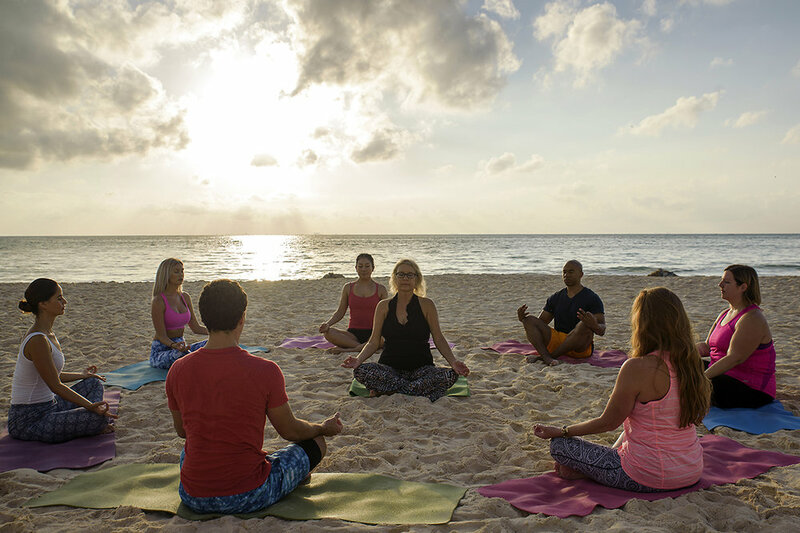 Once you successfully complete the Yoga By The Sea training, you then can apply for your RYT-200 certificate from the Yoga Alliance, which is internationally recognized. (Cost of the Yoga Alliance application not included in your tuition). Acceptance into the program is based on a written application and telephone interview. Once accepted and your deposit and travel waiver/release form received, you are eligible to begin your Yoga By The Sea Home Study Module. Advanced study-guide materials will be e-mailed to you which will include information on the major bones and muscles of the body and the key yoga asanas covered in the course. We will begin the program assuming that you have studied and learned this important foundational material. This will insure that everyone can move directly into the Yoga By The Sea curriculum upon arrival. The course combines experiential learning with the study of traditional texts. We recommend bringing a computer and a small printer if possible, or a USB drive to take to an internet location to get copies of your final homework projects, etc. printed. For your convenience, we suggest that you confirm that your lodging has a good internet connection prior to finalizing your living arrangements, although there are internet cafes in town. The daily schedule is from 7:00 am – 3:00 pm Monday through Friday. We begin with morning meditation, mantra, pranayama and journaling, followed by a break. There’s a daily 8:30 am yoga technique class, another break, discussion of teaching methodology, then our lunch break. The afternoon sessions included practice teaching, philosophy, anatomy and alignment, yoga history, the study of chakras, Yoga Nidra, the business of yoga, and special topics and presentations. Classes end on Saturdays about 1:30 pm. There are normally no classes held on Sundays. There are daily reading assignments and quizzes throughout the course on anatomy, the English and Sanskrit names of postures, the history of yoga, and a final exam at the end of the course. Each student will be prepared to teach a one-hour Hatha Flow class based on a theme, using the Yoga By The Sea lesson plan structure which works well for all yoga styles and techniques. These books are available at Amazon.com, as well as used copies of it. It would be helpful to purchase your books as soon as possible in order to begin familiarizing yourself with the Sanskrit names of the poses, and to read the inspirational words of Judith Lasater and Erich Schiffmann. I will also provide a compilation of valuable hand-outs, which is included in your tuition. To know more about Playa del Carmen and information on your travel, stay, money and safety, click here. To go directly to our Lodging Guide, click here.